A poblano is a type of pepper. Beyond that, my wife and I aren't sure if the word means anything—and Sonia is fluent in Spanish. If we had to take a guess just based on the sauce on this TJ's dish, we'd probably guess that "poblano" means "bland." If we had to take a guess based on the dish as a whole, we'd probably go with "nasty." At some point not too long ago, we had a TJ's fan write on our Facebook page that this particular Chicken Poblano item was excellent. Now, mind you, we know that from time to time there are extreme discrepancies between regions when it comes to people's experiences with Trader Joe's products. The Sockeye Salmon comes to mind. Apparently, in most places, the salmon Trader Joe uses in that product is barely fit for consumption by your cat, let alone yourself. But here and there, you'll find a batch fresh enough that it's not only passable, but relatively tasty. So I'm not going to call that person out there who claims that this Chicken Poblano is delicious a liar. I'm merely going to state matter-of-factly that our experience was something entirely different—and Sonia and I are 100% on the same page about this one. We were both thoroughly disappointed. The chicken itself was barely enjoyable. It was fatty and gristly. Both Sonia and I got at least one bite that we had to spit into our napkins because of an excess of...? ?...something unchewable. Overall the chicken lacked flavor, and the bites of tender, juicy white meat were far and few between. The sauce was even worse. It was virtually flavorless. With so many ingredients, we both hoped that at least one of them would come through to spice up the dish. But nothing. Just a bland mush. We were both independently shocked by the lack of flavor. We both expect more from TJ's. I never want readers to think we're taking a cheap shot at Trader Joe's. We're fans and always have been. But once in a while, we come across a product that is so sorely disappointing that if it had been our first experience with TJ's, it may have also been our last. This was one of those meals. I'm not saying that someone else couldn't have had a very different experience...because I know at least one person out there is somehow a fan of this product. I'm interested to see what kind of comments we get with this one. Whose dish was the anomaly? The person who loved it? Or Sonia and I? Sonia gives it 1 star, stating simply, "terrible." That sounds about right to me. We'll never buy it again. Bottom line: 2 out of 10 stars. Completely agree, this item was so bad I went looking for somewhere to make a negative review of it so that others would not make the same mistake I did in purchasing it. 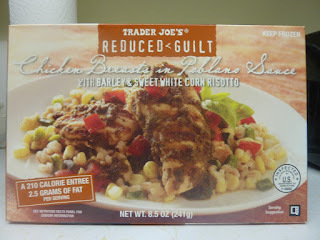 Most of the other frozen options I've had at Trader Joe's have been delicious, but I was trying to eat healthy so I picked this up...never again. This is hilarious, I was randomly searching the web and came across your web site. I've been wanting to find SOME place on the web to complain about what I felt was probably the WORST item I've ever tried at Trader Joes: The frozen Poblano sauce chicken. And here it was, the top of WGATJ's worst list. I feel vindicated. Mine was so poor I momentarily considered throwing it out. I agree with you! I was disappointed in this dish!!! It could have been good too with the flavors and combination they used, but I thought it was horrible! Agree 110% Its just awful and its hard to believe Trader Joe's would sell it. I just ate this for lunch and after experiencing the blandness, decided to search online to see if I could find similar reviews. I didn't find it to be inedible, but I definitely wouldn't purchase it again. It was so watery that the majority of the poblano "sauce" bubbled over into my microwave which, with the cleanup, is reason enough not to buy it. But I suppose at 210 calories and in a frozen meal, I should have expected it. I feel much better about hating my lunch today. I googled reviews on the dish before I took my first bite (which I just did, it's as bad as y'all said it would be) just based on the amount of water. I, too, had to mop up the microwave and considering this is my second week at my new job, I don't think Chicken Poblano is helping me make a good first impression... How can soaking wet chicken be so dry? How can something smell so enticing and taste so bland? It's like a mystery of science. Glad I'm not the only one out there disappointed with their purchase. They should change the name to Chicken Pobla-NO! Haha! I like that: Chicken Pobla-NO!